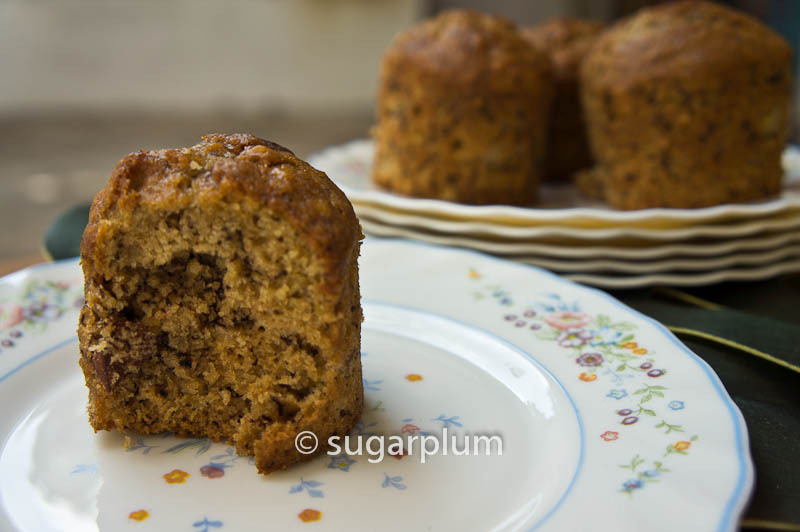 You will have noticed that bananas feature quite regularly in my muffin recipes. It's cheap and abundant here, plus there's always a hand or two handy on the kitchen counter for a quick healthy snack. Bananas also serve as a quick pick-me-up before a punishing Body Combat class. More energy for more stylo-mylo punches :) The flip side is being left with ripening or over-ripe bananas. 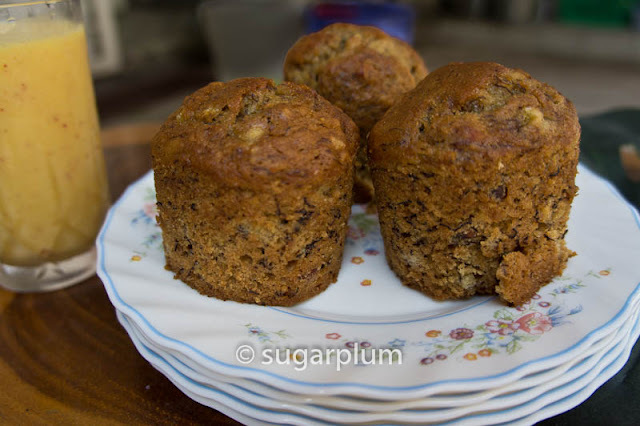 Luckily for me (and for the bananas too), they get converted into yummy muffins. 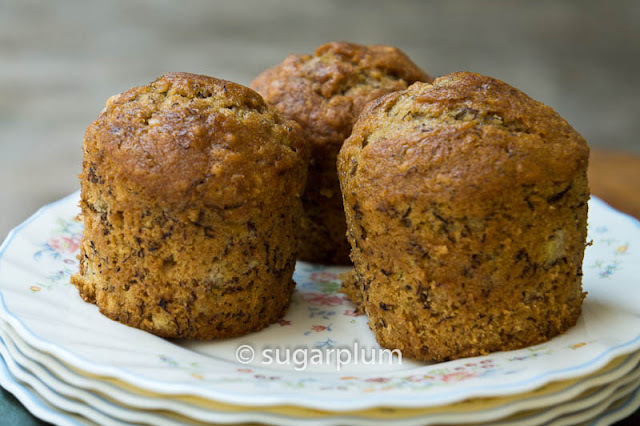 These banana nut muffins yield a moist crumb, punctuated by crunchy nutty bits with a natural sweetness from the bananas. Don't cut down on the amount of nuts as you want nuts with each mouthful. Instead of spicing it up with the usual cinnamon, coffee is used and gives it an added darkness to the flavour. Quite a nice change actually. As an added bonus, the only utensils required are a large mixing bowl, sieve and spatula - no mixer necessary. 1. Preheat the oven to 350°F/190C and lightly grease a muffin tray or line with muffin liners. 2. In a large bowl, mix butter into the mashed bananas. 3. Add in the sugar, egg, espresso and vanilla. 4. Sieve the flour with the baking soda and salt over the wet mixture and stir in until just barely incorporated. Do not over-mix. 5. Gently fold in the chopped nuts. 6. Spoon mixture into muffin tin and bake for 25-30 minutes. 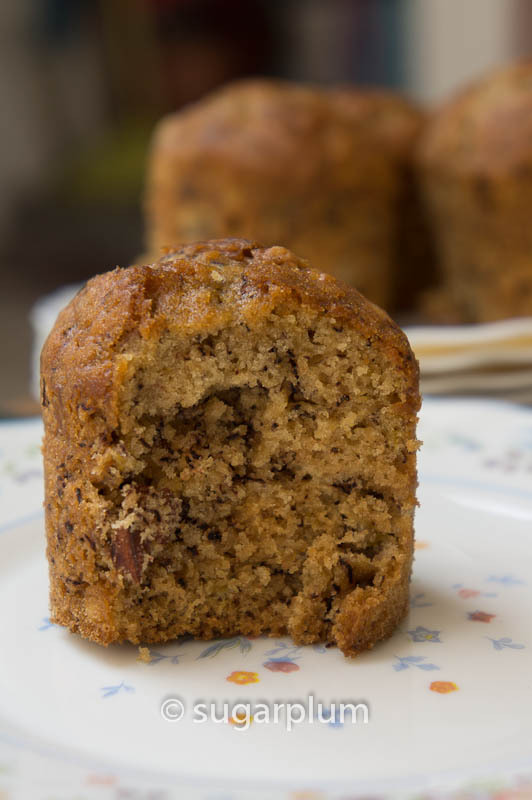 Check for doneness at 25 minutes with a toothpick inserted into the center of a muffin. If it comes out clean, it's done. 7. Cool on a rack before serving. Changes made to original recipe is in blue text. I reduced the sugar because the bananas are already quite sweet once they ripen.